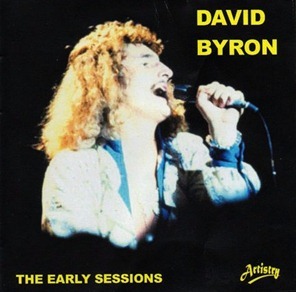 An official CD of David Byron's early recording sessions has finally been released. Recorded between 1968 and 1970 these archive studio master recordings in full stereo have now been compiled for CD. Now all true fans of David Byron can hear these 40 year old gems as they were intended. This CD has been compiled to commemorate what would have been David's 65th birthday on 29th January 2012. He was truly a superb vocalist - sadly taken from us at the age of 38 in February 1985. All tracks are taken from the early Avenue Recordings sessions with vocal assistance from artists such as Peter Lee Stirling (Daniel Boone), Reg Dwight (Elton John) and Dana Gillespie. This is a goldmine of music for any follower or fan interested in the early years of the original lead vocalist with Uriah Heep. Many people thought that these master tapes had long been lost forever - now thanks to Artistry Recordings they have been dusted off and carefully re-mastered to digital format. No more do you have to listen to scratched 40 year old vinyl on various quality pressings. No more will you have to pay outrageous prices to unscrupulous dealers at record fairs and flea markets etc., - these are the genuine recordings that you may have been looking for many years. This much sought after release of David's early material has been manufactured to the highest standard in England at a highly reputable manufacturing plant and is not to be confused with cheap pirate counterfeit CDR products that are killing the music industry. Buy with confidence - this superb album will surely take pride of place in any fan's collection.